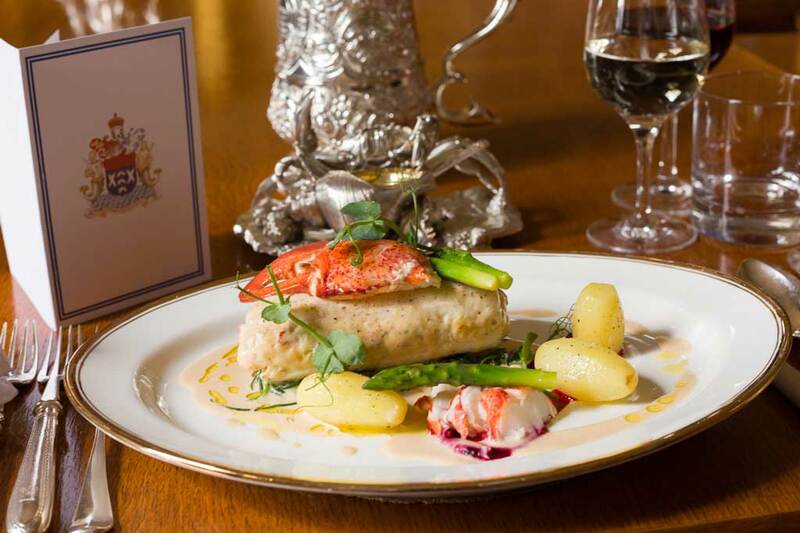 A master at creating spectacular banquets for the Fishmongers’ Company, Steve Pini prepares a legendary dish for the Easter “feast of feasts”: sole Walewska. Steve in full fig prepares for dinner in the Fishmongers’ banqueting hall. Easter is one of the biggest feast days in the calendar; indeed it’s sometimes known as the “feast of feasts”, especially in the east. Coming at the end of Lent, traditionally a time of fasting, it’s the perfect time to enjoy spring’s bounty, and to look ahead to the languorous joys of a long, hot summer, hopeful barbecues at the ready. And it’s in search of inspiration for our own damned good Easter lunch that we head to Fishmongers’ Hall, HQ of the Fishmongers Company, one of the Twelve Great Livery Companies of the City of London. The Fishmongers have a deserved reputation for laying on some of the finest feasts in town, with spectacular seafood always taking centre stage. Their Hall has some of the finest views in town too. Overlooking the Thames slap bang on London Bridge, the echoing halls and gilded rooms of this classically handsome building are a world away from the hurly burly of the City just outside the front door. If ever there was a window to stand and watch the world go by, it’s here. 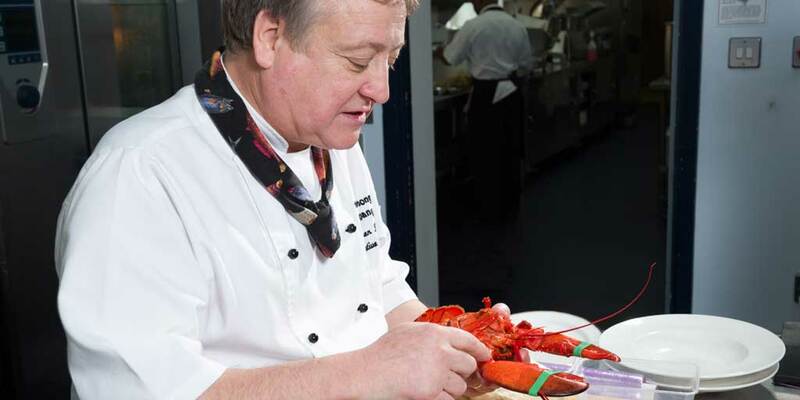 Getting to grips with a Canadian lobster. Looking around the Hall, there’s history (and fish!) everywhere: in the paintings on the walls, the books in the library, the ancient narwhal tusks on ether side of a door, the heavy silverware on the elegantly laid-up tables. That’s not surprising. One of the oldest guilds in the City of London, the Fishmongers’ Company was recognised as an organised community long before Edward I granted its first charter in about 1272. That and subsequent documents gave the Company a monopoly on the sale of all fish in London that lasted well into the 15th century. With fish a mainstay of medieval existence, this strikingly generous arrangement guaranteed the Company considerable wealth and influence. 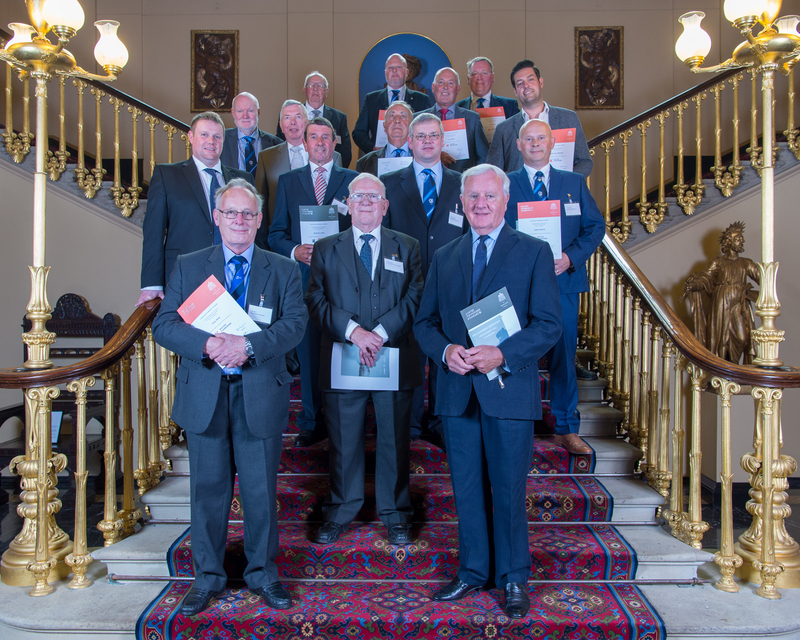 More than 700 years later, it no longer taxes fish, but it’s still heavily involved in all aspects of the UK fishing industry, one of the few ancient Livery companies still closely connected to its historic trade. Remarkably, it still maintains a team of inspectors who ensure the quality of seafood sold at Billingsgate, a role it has performed at both the new site in Tower Hamlets and the old one in Southwark all the way back to 1604. Steve’s son Stefan now works at the Hall too, after stints with Bruno Loubet and Tom Kerridge. 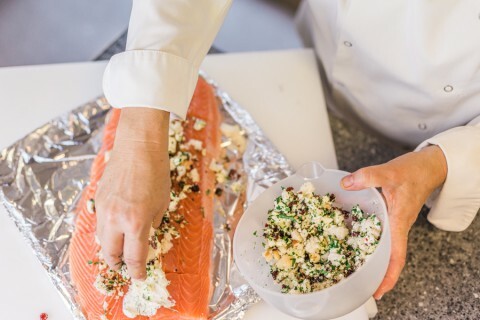 The inspectors also regularly assist with courses offered at the Billingsgate Seafood Training School, which was founded by the Fishmongers’ Company in 1998. 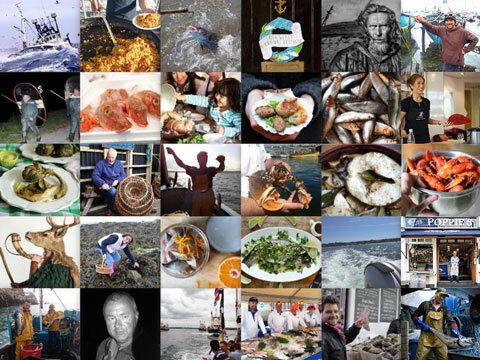 Plus the Company helped establish and now supports a variety of other fish-related organisations and initiatives, including the UK Marine Biological Association, the Salmon & Trout Association, the Shellfish Association of Great Britain – and this website. Suffice to say that the Company knows a thing or two about fish. 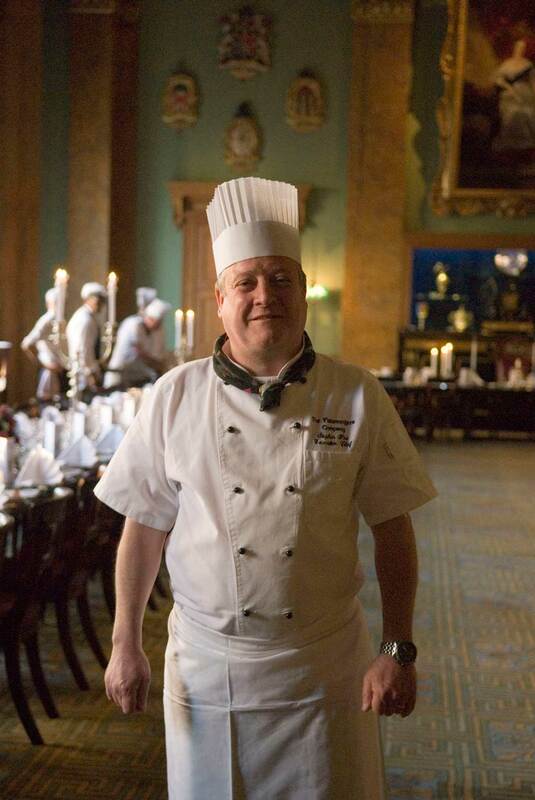 And Steve Pini, its Executive Chef, knows plenty about cooking it too. He arrived here 17 years ago with the brief to transform what was then rather old-school nanny food and lay on the best banquets in London. Consensus is that he’s done a cracking job. His style reflects his classical training at the Grand Hotel National in Lucerne and the George V in Paris, but often displays a light fusion touch, inspired by globe-trotting visits for culinary inspiration, with Japan and Sri Lanka particularly standing out in his memory. A legendarily decadent dish, Steve’s version is made with lemon sole, collops of lobster, a champagne sauce and black truffles: click here for the recipe. It’s not that hard to make and doesn’t have to totally break the bank: lemon sole is excellent value right now, as is Canadian lobster (although native ones are superb at the moment), any sparkling wine is fine and you can use truffle oil instead of fresh – a little goes a long way! And without a doubt, if you serve this up for lunch on Easter Sunday, the room will fall silent. 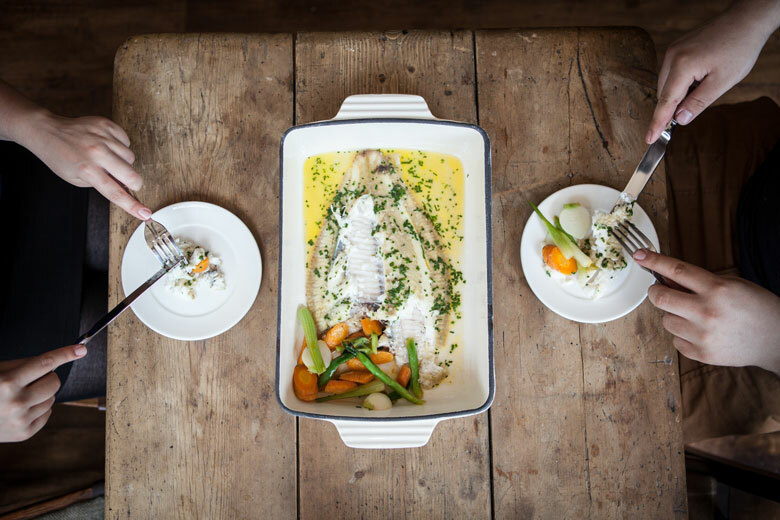 For the final Fishmongers’ touch, serve with a good white Burgundy or even a claret: it’s a tradition at the Hall to serve red wine with the main fish dish. Happy Easter! To find out more about the Fishmongers’ Company and Fishmongers’ Hall, visit fishhall.org.uk. 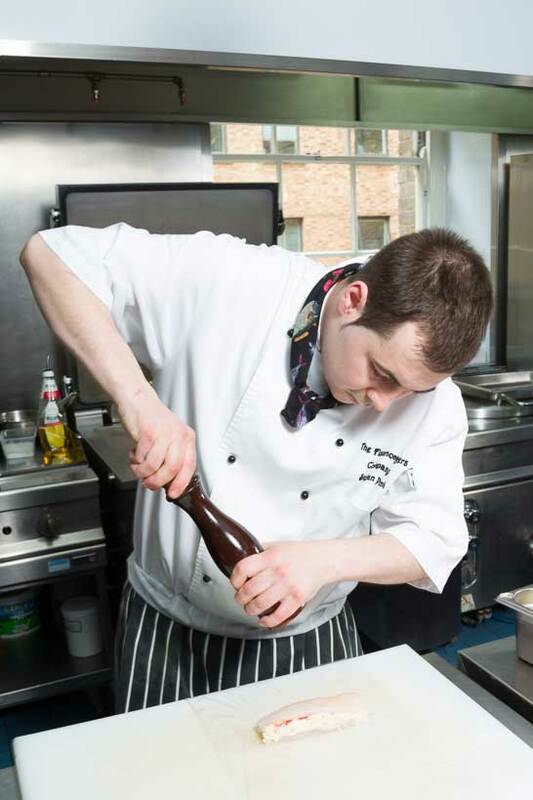 To enquire about tours, email enquiries@FishHall.org.uk. To enquire about hospitality and events, email hospitality@FishHall.org.uk. 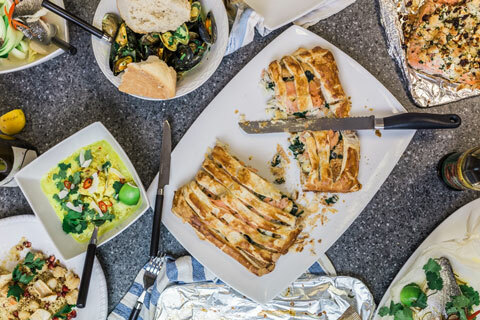 This terrific traditional seafood treat by CJ Jackson of the Billingsgate Seafood School is just the thing for a festive spread as the family assembles on Christmas Eve.